Telling your insurer that your two-wheeled pride and joy spends its down-time in secure storage can make a tangible difference to your premium, especially when it’s in the form of the specially designed Protect a BikeTM from Trimetals. Protect a BikeTM is a unique metal motorcycle garage that offers significant benefits over other anti-theft devices for motorcycles and scooters. Combining convenience with security, it keeps your motorcycle completely enclosed and out of sight – safe and protected from the elements – and once assembled is maintenance-free and fire resistant. 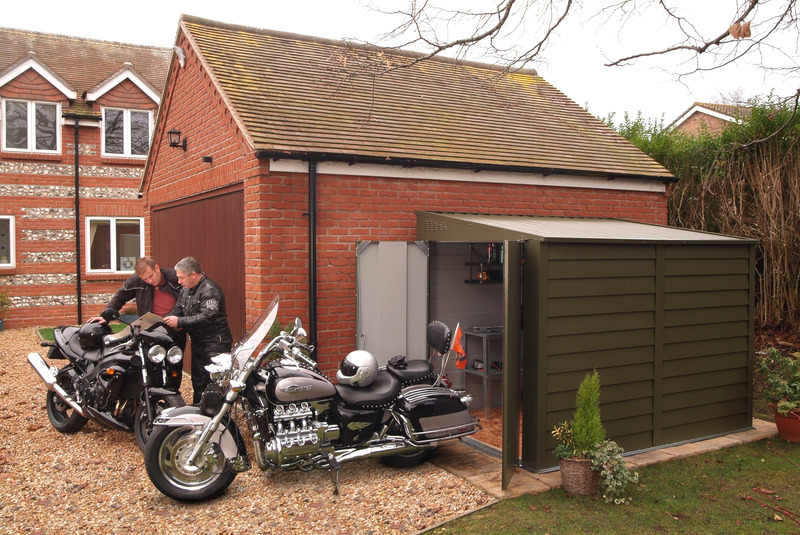 Constructed with superior quality PVC coated galvanised steel, each of the three different size options is guaranteed for 25 years and they are the only secure motorcycle storage solutions to have achieved Loss Prevention Certification Board approval to both level 1 and level 2. Protect a BikeTM has also been awarded the Secured By Design mark – the official Police Preferred Specification. More than just a garage, Protect a BikeTM comes as a comprehensive, yet affordable security package as it also includes a heavy duty ground anchor (Gold rated by Sold Secure) and 1.5m chain with padlock (both Thatcham Approved) for securing the motorcycle inside the garage. There is also a stainless steel hasp and padlock for the front doors (which is in addition to the standard door bolting system) and a battery operated PIR alarm system. Also all external bolts are fitted with lock nuts to prevent panels being removed from the outside. So, by having your own secure motorcycle storage you can rest assured that you are protecting both your bike and your financial interests as the discounts given by insurers could pay for the garage over time.